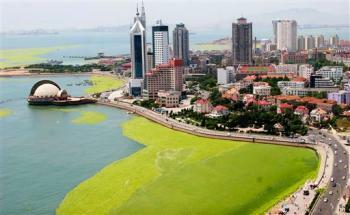 Coastal eutrophication is an increasing problem in China, due to their massive use of fertilizers. Warmer waters, increased rainfall and high levels of nutrients in the ocean brought about the algae explosion along vast stretches of the 800-kilometer (500-mile) coastline, according to the Qingdao Weather Bureau. Qingdao, located 830 kilometers from Beijing, is mobilizing more than 1,000 fishing boats to scoop up the algae and contain the outbreak, Wang said.